IT asset management work has been extended recently to cover smartphones, virtual machines and more. KDDI Cloud Inventory centralizes global multi-device management services over endpoints such as Android, iOS mobiles, desktops and notebooks (Windows/Macintosh) both within and external to your business offices. The cloud approach makes endpoint management operations global and transparent. A single web-console covers all endpoints from desktops to mobile devices. 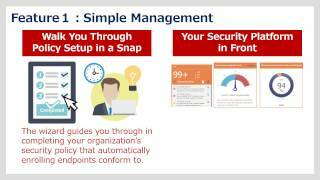 Endpoint management tasks are easily streamlined into automated actions. Trilingual user interfaces extend endpoint management tasks to English, Chinese and Japanese speaking IT staff. Centrally managed security policies reach diverse global endpoints. Capable of Detection, Prevention and Removal of targeted attacks, ransomware and other unknown malware. When it comes to defending against targeted or as yet unknown threats, regular antivirus software alone isn't always enough. KCI's behavioral detection provides endpoint protection that doesn't depend on pattern-matching files like antivirus software and can stop even new, unknown threats such as targeted attacks. Using unique technology, KCI's behavioral detection predicts an attacker's method of attack, using five analysis engines to approach the attack from multiple angles and provide a hybrid defense for endpoints. From a single web console, "KDDI Cloud Inventory" allows the centralized management of endpoints including Windows PCs, Macintosh computers, and both Android and iOS mobile operating systems. The endpoints are under the management of headquarters or subsidiaries, whether located in the head office or anywhere in the world. The versatility of KDDI Cloud Inventory is based on the Internet and cloud computing. In other words, Internet connectivity is the only prerequisite for KDDI Cloud Inventory to function. 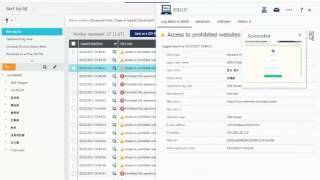 KDDI Cloud Inventory is a cloud solution that keeps endpoint configurations and applications secure, thus providing stable usability for workforces in line with your organization's security policy, public regulations and compliance directives. The solution will cut costs and complexities and reduce your IT department's daily workload by optimizing endpoint management tasks. Based on the Security Profile that we develop and update daily with anti-threat definitions such as malware and vulnerability countermeasures, your organization as a whole is automatically rated through a scheme of security levels, with easy access to detailed reports. 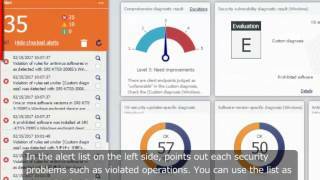 Security administrators can view the dashboard, which provides an easy-to-read diagnosis using colors and scales, to see present security risk levels. Listing HW/SW inventory. The data can be exported by CSV. Reporting MS-Office /Adobe apps Utilization. Inventorying Standalone PCs. A portal site with a list of apps which users can download. Diagnosing security vulnerability of client devices and indicating security in one of the 5 security levels. Reporting antivirus SW installation status. Applying the policy to enforce updating Wins OS, Adobe Reader and so forth on client devices. Detecting banned Apps and controlling launching them. Controlling access connections to Wi-Fi and VPN networks. Restricting　access the data on SD card/Bluetooth. Restarting the ISM client program automatically whenever it is stopped. Detecting the CNFIG profile is deleted. Restricting the usage of specified apps when a device is lost or stolen. Locating the lost device on Google Maps/BingMaps, helped by GPS. Remote Locking or wiping out the lost/stolen devices or a failure in compliance. Finding rooted /jail broken devices and notifying the ADMIN by mail. Assigning or switching to the pre-defined stringent policy on a failure in compliance. 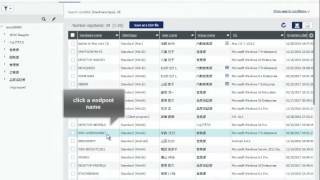 Remote controlling client PCs via the premise network. 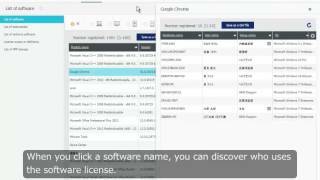 Distributing software, folders and files via the premise network. Distributing and uninstalling apps on client devices. Inventorying lease /rental assets and checking for terminations in advance for notification or alert. Finding the assets by serial No, user name, software, etc Gathering questionnaire data that users have provided on a form, and putting them into other inventory data. 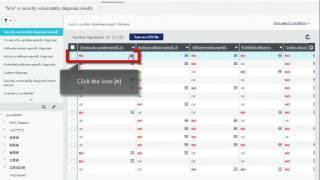 Finding the target clients by common properties or keywords. 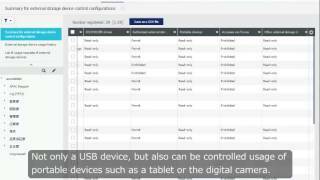 Controlling external media such as USB memory devices. Collecting user operation logs on PCs via the internet and makes clear the inappropriate activities of PC. Encryption the whole hard disk. Certification before the OS start. Unknown threats are detected,stopped and removed using engines that predict malware behavior.